AuthObserver - An object used for authenticating connections. The AuthObserver type provides a mechanism for participating in how a Server (or a Connection) authenticates remote peers. Simply instantiate an AuthObserver and connect to the signals you are interested in. Note that new signals may be added in the future. 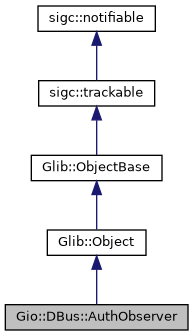 Emits the Gio::DBus::AuthObserver::signal_allow_mechanism() signal on observer. mechanism The name of the mechanism, e.g. DBUS_COOKIE_SHA1. true if mechanism can be used to authenticate the other peer, false if not. Emits the Gio::DBus::AuthObserver::signal_authorize_authenticated_peer() signal on observer. stream A IOStream for the Gio::DBus::Connection. credentials Credentials received from the peer or nullptr. true if the peer is authorized, false if not. Emitted to check if mechanism is allowed to be used. Emitted to check if a peer that is successfully authenticated is authorized.